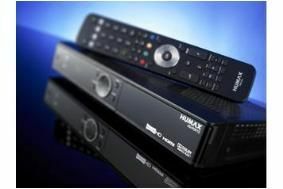 Humax adds PVR recording functionality to HD-FOX T2 set-top box | What Hi-Fi? Owners can get the update from the Humax download centre. Once installed, the latest software enables single-tuner recording, pause/rewinding of live TV, series recording, instant recording and the ability to record one channel while watching another, provided both channels are on the same multiplex. Additional benefits include fixes to HD audio distortion (reported with some TV sets) and lockup problems with the EPG.